Calling Friends and Family Outside the Country is Cheap and Easy with the Pingo International Calling Card. Get dialing. Sign up for your international calling card today! Stay Connected to Loved Ones with Your International Calling Card! 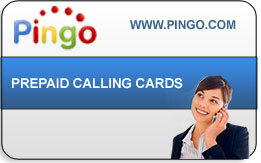 All Pingo International Calling Cards are Backed by Pingo’s Stellar Customer Support. Plus, There are no Hidden International Calling Card Fees!